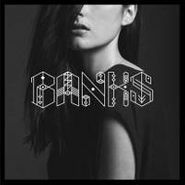 When Banks’ “Waiting Game” was released last year, its rumbling bass tones and seductive vocals made it an immediate hit amid bloggers and internet-radio programmers. Its accompanying London EP appends that electro-soul gem with three more songs that show L.A.-based Banks and her producers are no one-song fluke. “This Is What It Feels Like” is slightly more beat-driven than the sultry “Waiting Game” but follows the same minor-key melancholy and spectral production touches. “Bedroom Wall” drops the beats entirely for the first half-minute or so—a neat trick that allows Banks’ lovely voice a change to connect to the listener, entreating that her “arms are open for you” as she paints a picture of longing—while the production balances its sensuality faint thunderclaps or fireworks and wavering synth tones. “Change” puts Banks front-and-center, as her low-end vocals seem to fill every inch of the track over a stuttering beat. It’s a stunning showcase for the singer. Given her recent opening slot touring with similarly minded The Weeknd—and popular, similarly minded recent offerings from Kelela and Beyonce—the way should be wide open for Banks to take 2014 by storm, starting with the great London EP.